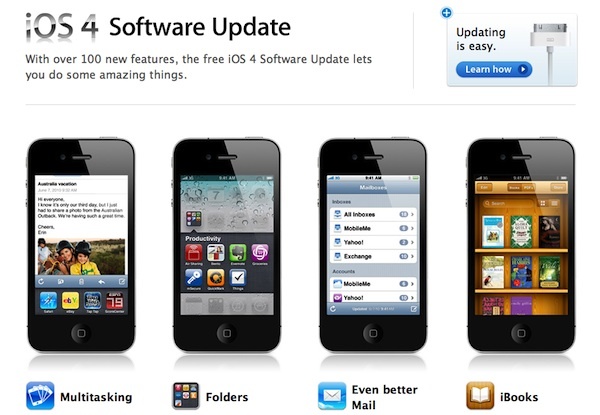 Today, Apple has released iOS 4, formerly known as iPhone OS 4.0, for iPhone and iPod touch owners. The update, free for iPhone and apparently, also free for iPod touch owners, is available now. To download the update, connect your iPhone or iPod touch to your computer running iTunes 9, and the software installer will be downloaded to your computer. Unlike previous iOS updates, the iPhone G2 and the first generation iPod touch will not be supported for this upgrade. Additionally, iPhone 3G owners will not be able to use the new multitasking features of iOS 4. If you want to get iOS 4 and you have one of these devices, you're going to have to upgrade your hardware. iPad Out in the Cold? No! Apple's iPad customers will be getting an upgrade to iOS 4, however, they are going to have to wait until the fall for their upgrade. For more details, check out the iPhone or iPod touch pages on the Apple website.